﻿Our intellectual investigation undoubtedly requires a starting point, some kind of proverbial launch pad. So what better place to begin our journey than the very nexus of Canadian film distribution itself? That’s right, we put on our walking shoes and went to the National Film Board headquarters in Montreal. 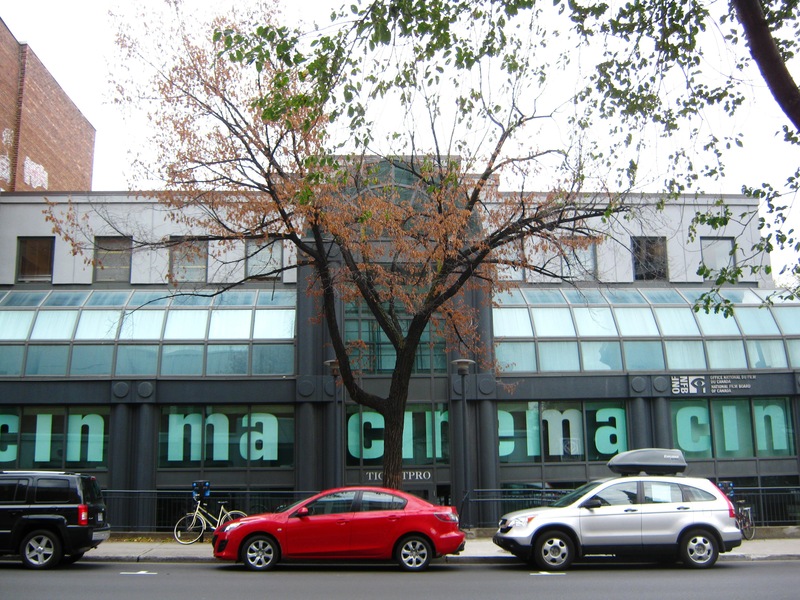 We ventured out to the corner of Sherbrooke and St. Denis to see just how the country’s institutional founder of film presents itself to the Canadian public. about the NFB’s mission to produce and distribute Canadian-made films to the Canadian public. He graciously welcomed our party to the building and invited us to take a look at their public space, where we had to opportunity to browse, purchase, and view over 10,000 films. 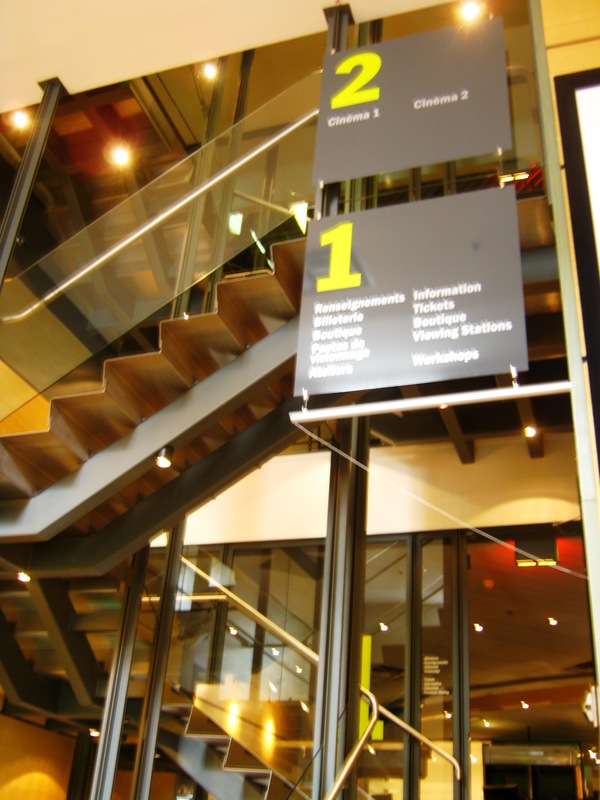 ﻿We ascended a nearby staircase and entered the buying/viewing/browsing room, an open-concept area where everything NFB is at the visitor’s fingertips. 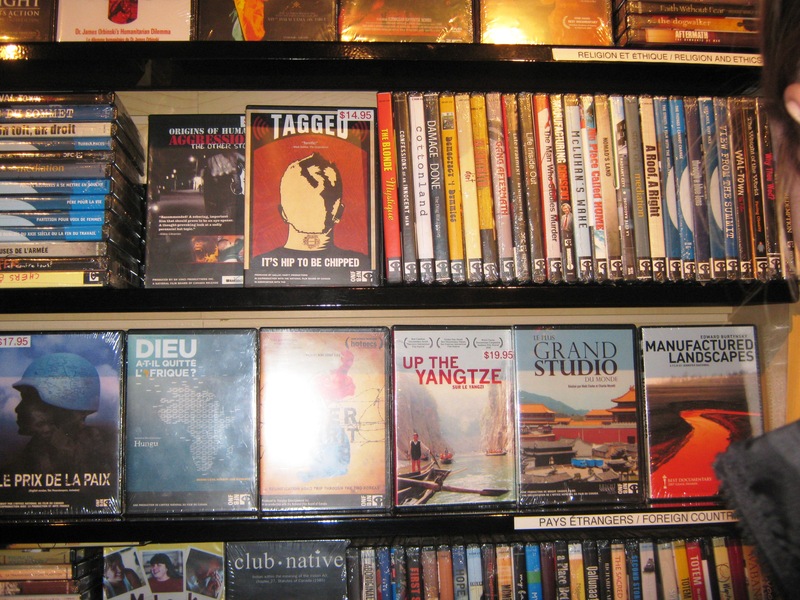 Here, we gazed at a wall of NFB DVDs, all for sale. ﻿What struck us first about the wall display were the categories. Contrary to your average Blockbuster or Rogers, whose films are organized roughly according to the basic genres (comedy, drama, etc), the NFB chooses to categorize its films according to cultural topic, or rather “issue discussed.” This was interesting to us because it showed a cultural sensitivity on the part of the NFB; these weren’t movies, they were Canada’s films. ﻿ A particularly curious component of the wall display was the inclusion of blank VHS tapes “hidden” behind each DVD. ﻿This slightly odd (but nonetheless charming) aesthetic choice was subtle, but we felt it fit rather nicely with the NFB’s observed reputation for referencing its historical roots. The effect is poetic: one cannot pick up a new DVD without a reminder of its technological predecessor. Historical references are quite literally embedded in the walls! ﻿ The viewing experience at the Cinerobothque was like nothing we’ve partaken before. Like in a traditional cinema, it was a weird mix of the public and private, but at the NFB it was the inverse to the melange that is the Pepsi Forum. The regular movie-goer sits in amongst an auditorium of other people in the dark, sharing the same screen and speakers. 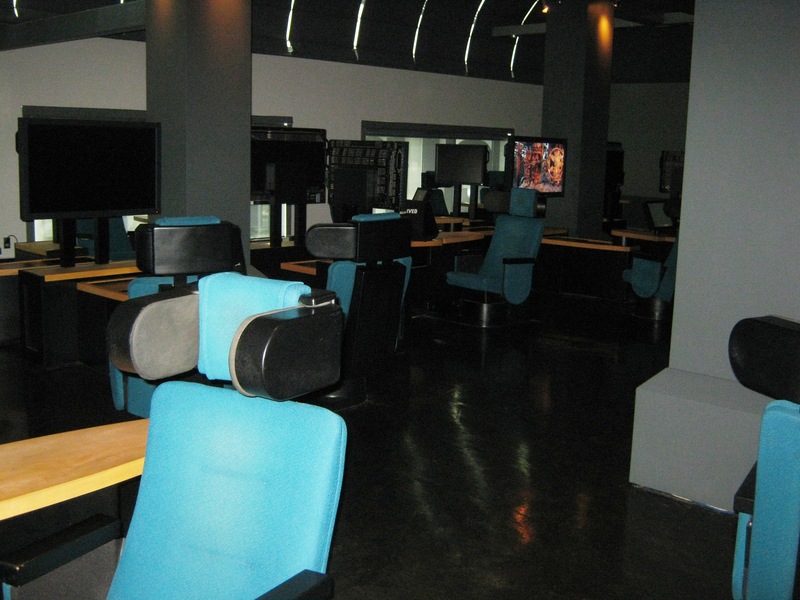 At the NFB however, instead of an auditorium, a cluster of personal viewing stations fills the second floor. Either alone or in pairs, high backed padded seats with a personal screen and a pair of speakers that wrap around your head make for a unique, and might we add thoroughly enjoyable, viewing experience. You are still sharing the space with other viewers, but it is much more personal than the typical form of public cinema. ﻿If we can go out on a limb here and jump to some ridiculous conclusions, do permit us. through the viewing experience at the NFB. ﻿The film that we watched during our trip to the NFB was Sleeping Betty by Claude Cloutier (you can watch it here). The woman working at reception recommended it to us as one of her favourites: it was light and humourous, a familiar tale, and not too long. In short, it was all you would want from an introduction to the NFB and to the Cinerobotheque. As an animated film, she introduced us to the NFB and Canadian film with one of the strong suits of Canadian film production. Sleeping Betty was the story of Sleeping Beauty retold with a bizarre and hilarious melange of British figures and a Montreal landscape: King Henry VIII and Queen Victoria looked on while Prince Charles came to the rescue of Betty who had fallen into a deep sleep in her Montreal walk-up. Our first impression was that this was a charming representation of the two main identities of Canada: British heritage and French Canada (we should add that the characters spoke in gibberish, so as not to ally with one official language or the other). As soon as we reflected on this however, all the problems we have with trying to pinpoint a Canadian identity reared their ugly head again. ﻿Though for us, this mix of heritages applies quite nicely cause we have pretty-far-removed British heritage and have grown up in and around French Canada, but how does how does this film jive for people who have no tie to either of those cultures? To them wouldn’t this remain just a bizarre little reimagining of a familiar tale? If that’s the case, then hasn’t the NFB fallen through on their mandate of representation of Canada to Canadians? Or is that why the NFB exists, to be able to house this sort of film alongside a multitude of other interpretations? Is this better than there actually being a cannon of Canadian films or well-defined identities? Or does it just keep us fragmented, because, as represented by the films available at the NFB, there are literally thousands of choices available with which you can identify? This entry was posted in Uncategorized and tagged Montreal, NFB. Bookmark the permalink.